I was nervous upon reading the other reviews and realizing that what came could've been amazing or janky... stickers/colors/etc... but she LOVED it. So, I'm happy. The product arrived in good condition. It had a unique feel to it. Great gift for a snowboarding enthusiast! I was hoping the recycled snowboard would resemble the quality of the one in the photo. This snowboard looked like one owned by a 15 year old boy, covered with obnoxious stickers. 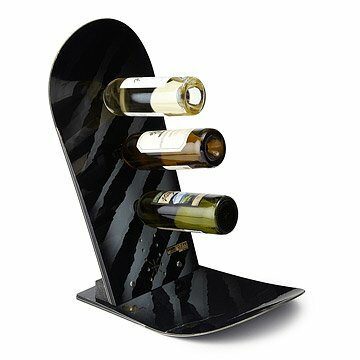 It was not appropriate to use that particular snowboard to construct a wine rack for an adult. I wanted to exchange it, but view a photo of the replacement first, but that wasn't possible. I was hoping they would cover return shipping, given the product was not at all as expected, but I was refused. Recycling is great, but the materials chosen need to be appropriated for the product, and the end user. This was a Christmas gift to our snowboarder son! The clever "artsy" look is eye-catching, fun, functional and a great conversation piece. Unique and very well made! LOVE it! Such an awesome gift idea! It's the perfect gift for a beer/wine drinker. I got this for my husband for Christmas and he loved it! He's obsessed with snowboarding so this takes two of his favorite interests and combines them into one. I can't wait to use it at our new house for parties and entertaining or just a date night! Unique gift for my boyfriend who is a snowboarder and likes wine, this and 3 bottles of nice California reds.